Sacred Icons and Sacred Images – the Nicene Debate Continues! A photo of the inside of the Aya Sofya (Hagia Sophia) church in what is the present-day city of Iznik, Turkey. Iznik was called Nicaea prior to the rule of the Ottoman Turks . This photo shows the interior of one of the rooms in the building complex that served as the location for the First Council of Nicaea (AD 325). Also, in the late 8th century the Seventh Ecumenical Council met in this building, too. That Council met to debate and decide the issue of iconoclasm (should sacred icons and images be prohibited and destroyed). The written arguments of St. John Damascene (Damascus) won the day and sacred icons were allowed to continue to be made. Iconoclasm was to raise its ugly head again in later years, and came to full fruition during the Protestant rebellion/reformation, the French Revolution, and worldwide Communism in all its cultural forms. This photo of the inside of the Nicaean building is from Bryan Cross’ website: calledtocommunion.com. It was posted in May, 2010. Thanks Bryan! I would like to thank one of my readers who identified the contemporary icon of St. Spyridon (thanks Carol!). The iconographer is the Catholic priest William Hart McNichols. He is a very talented artist who paints traditional icons and sacred images. At times, he steps out of the bounds of the traditional approach and adds his own personal interpretation of the person he is portraying. His artistic vision is unique. John Daly from Australia emailed me this morning to provide further grist for our mill concerning St. Athanasius, St. Spyridon, and the Council of Nicaea. One of the participants in his iconography school is a Greek Orthodox lady who is the sister-in-law of an Orthodox priest. He is coincidentally named Athanasius. John had the opportunity to discuss with her the icons that we were analyzing in my posts of the last few days. She provided John some valuable information by explaining that her mother had given her a beautiful sacred image of the First Council of Nicaea and specifically St. Spyridon’s role in the debate with the heretic Arius. The sacred image is below. Greek Orthodox sacred image of the First Council of Nicaea. Notice St. Nicholas on the lower right about to possibly physically strike Arius who reacts by pulling away. On the left you see St. Spyridon, holding a brick with flames streaming upward and water puddling below it to the floor (confer yesterday’s post of April 16th to obtain the explanation of that imagery). The room of the actual Council, as portrayed in this sacred image is quite ornate. Also, like the sacred icon we examined in yesterday’s post we see the Emperor Constantine, dressed in the royal robes of Byzantine reddish purple (almost a maroon) sitting on the right. On the Emperor’s right we again observe a bishop, maybe its Bishop Alexander of Alexandria, Egypt. In front of him we again see a deacon, dressed in what is either an alb or dalmatic (he would have to stand up to see all the garments). In the above sacred image, the deacon is again seated at the scribe’s desk. This makes sense, since a deacon serves the administrative needs and report’s directly to his bishop. That is true to this day; yet, throughout the world today the local bishop has his deacons serving in parishes, hospitals, prisons, etc. rather than in an administrative capacity in the local chancery. Notice the bishop is behind the deacon scribe to facilitate accurate communication. The above sacred image, which I have never seen before John Daly sending it to me, is very well done. The painter has captured the meaning of the Council as a whole and two of its major participants: St. Nicholas’, in his famous interaction with the heretic Arius, and the great oratorical and mystical abilities of St. Spyridon challenging Arius, too. Is the deacon pictured in the painting from the Latin Rite or is he Orthodox? Truly, there is no way to accurately tell because the deacon is seated, and what is showing of the deacon’s stole is inconclusive. Depending on the angle of view both the Western and Eastern Rites’ deacon’s stole placement looks the same. In today’s painting and in yesterday’s post of the icon, the deacon is seated and the possible vertical panel on the Eastern Rite and Orthodox stole is in shadow or not detectable, yet, the panel that drapes from left shoulder and gathers at the waist is visible, and would appear, as you see below, in both Latin, Eastern, and Orthodox Rites! Just between you and me, I think the deacon depicted in the icon, from my April 16, 2019 post and today’s, is St. Athanasius from Alexandria, Egypt. The Catholic Church, the Eastern Rites in union with Rome, and all the Orthodox Churches venerate St. Athanasius as a great saint and designate specific feast days for him. He belongs to all of us. Orthodox deacon’s stole in a royal Byzantine fabric (in what appears to be a royal maroon purple) is bordered in gold thread with gold crosses. Originating at the left shoulder, gathered at the waist, with the fabric of the stole hanging vertically on the left shoulder both in the front and the back. The stole is worn on top of the ornate gold and white dalmatic. A Roman Catholic deacon’s stole running from the left shoulder and gathered at the waist, then hangs vertically under the right arm. It is worn on top of a white alb, and under a dalmatic. The dalmatic is only worn during Holy Mass. When the deacon performs baptisms, marriage and funeral services, liturgical prayer services, and formal blessings, etc. the deacon would not wear a dalmatic, so the deacon would appear as in the above photo wearing a simple white or cream colored alb and a stole in the appropriate color.. The stole’s fabric in the photo above is dyed dark purple for Lent; during the season of Advent a purple stole is used, too; sometimes, it is of a lighter purple than the Lenten penitential purple. A white stole would be used for Baptisms. Marriages, Funerals, Holy Thursday services, and during the Easter and Christmas season. Red stoles would be worn at Palm Sunday and Good Friday services, Pentecost, and on the feast days of martyrs. A Roman Catholic deacon’s dalmatic which is worn over the white alb and the stole. The dalmatic is in the corresponding color to the stole. The color green is worn during “Ordinary” time (which is the liturgical period that borders the great seasons of Advent, Christmas, Lent, and Easter). I’ve really enjoyed this lively information exchange. Thanks to all who participated in it! May you have a blessed Easter Tridiuum of the Passion and Resurrection of Our Lord Jesus Christ. Copyright © 2011- 2019, Deacon Paul O. Iacono – All Rights Reserved. Permission to reprint must be obtained from the author in writing. Students, and those interested, may quote small sections of the article as long as the proper credit and notation is given. Thank you. St. Athanasius and St. Spyridon: A Correction and Another Interpretation – Let’s Take A Closer Look! This is the sacred icon of a bishop confronting a heretic at the Council of Nicaea (AD 325). Mr. John Daly of Melbourne, Australia informed me that we should take a closer look at the details of this icon because of how it depicts the bishop’s castigation of the heretic. I concluded erroneously that it must be St. Athanasius since he was a pivotal orthodox figure at the Council. Even though he was a deacon at that time, and not a bishop at the Council, he was ordained a priest and bishop about three years later, so the iconographer just inserted him as a bishop. Mr. Daly recommends a closer look to discover that it is St. Spyridon of Cyprus. Mr. Daly is correct – it is St. Spyridon (born AD 270, died 340). The bishop castigating the heretic Arius is wearing a distinctive hat. The hat is unique. It is shaped like a beehive. It is made of woven straw and was traditionally worn by Cypriot and other shepherds tending their flocks – an apt metaphor for a bishop caring for the flock of his faithful. St. Spyridon was from the island of Cyprus, and eventually became a bishop serving the people of Trimythous, thus, he would have been invited to the First Council of Nicaea as were all the other bishops in Christendom. At another time, possibly in Cyprus, St. Spyridon was involved in a debate with a pagan philosopher whom he ultimately converted to Christianity. Besides his theological arguments about the Holy Trinity, the good bishop used a piece of pottery or a brick, to demonstrate to the philosopher how you could have one single substance be also composed of three separate substances (pottery and bricks consist of clay, water, and are unified by the substance of fire). The story of his discussion with the pagan philosopher continues and says that as soon as St. Spyridon finished speaking the piece of pottery or brick burst into flame, water dripped from it, and clay ash remained in his hand. Well that would have been enough to place me on the road to conversion, and so it was with the philosopher, too. If you look closely at the icon above you can perceive the fire bursting out of the brick and the water puddling beneath it. Hmm, I didn’t see that! As Sherlock Holmes once said, “Watson, you see, but you do not observe” (taken from the story A Scandal in Bohemia by Sir A.C. Doyle). Wise advice. Mr. Daly also relates that it was [and probably still is] common for an iconographer to fuse the two incidents of St. Spyridon converting a pagan, and St. Spyridon at the Council of Nicaea debating with the heretic Arius. There it is: the beehive woven straw hat, the bishop’s vestments, the water, fire and ash metaphor, the confrontation with an individual that has an opposite argument, and the public venue for both incidents. So where is St. Athanasius in this icon? Mr. Daly offers that in the upper left corner of the icon, we see an individual portrayed as listening intently to St. Spyridon. He is dressed in a dark alb with a white collar. He suggests that this is St. Athanasius. That argument makes some sense because, as a deacon, Athanasius may not have been up front with the bishops, rather he possibly would be located near the altar ready to perform his diaconal duties. At the same time he is still involved in the proceedings, and/or ready to respond to the needs of his bishop – Alexander of Alexandria. You notice the priests and monks in the back of the room, too, in dark conical monastic hats and cassocks. My only issue with that interpretation is that the figure portrayed in the upper left does not have a nimbus (halo) circling his head, nor is he wearing his deacon’s stole; however, the scribe in the lower left corner is wearing a deacon’s stole. My stole comes across my chest from the left shoulder and is gathered at the right hip; and the scribe’s stole does the same thing. Is this individual St. Athanasius? There appears to be writing on his stole. I have no proficiency in Greek so I cannot be of help there. The scribe in the lower left corner has a halo, too, and so do all the bishops. Did the iconographer think that all the bishops present were saints? This is not unlikely, since they produced a Creed for Christendom in three months. Truly, a stunning achievement. It indicates that the assembled bishops were very clear in their own minds what the Faith, based on Scripture and Apostolic Tradition, was all about. The bishops all appear very animated and involved in the Council proceedings. It’s obvious that the Holy Spirit was working within that Council! There is a lot going on in the upper part of this icon, too. Christ, as a young child, is found walking across what appears to be an altar towards another bishop. That bishop on the upper right is seen discussing some issue with, possibly, another dissenter (a priest, or deacon; even though the priests and deacons in attendance didn’t vote, they certainly could influence the bishop of their diocese on issues and arguments). Sadly, I believe that the only existing documents that we have concerning this Council that are still in existence are the Nicene Creed itself, the procedural rules of the Council, and Emperor Constantine’s address to the assembled bishops. It is said that many of the bishops came, returned to their dioceses, and then came back to the Council. This probably contributes to the fact that we don’t have all the names of the participating bishops, just those mentioned in other documents or in the stories that were passed on through to the faithful (confer Anna Erakhtina’s article The “Model of Meekness,” and Slapping Arius, at http://www.orthochristian.com, May 22, 2016, specifically the contribution by Archpriest Vladislav Tsypin. He discusses the documents available to us today). If anyone has additional information on the actual participants please tell me your source, and the participants, and I will spread the information through a post. St. Spyridon was also known as a miracle worker, especially for his successful intervention (caused by the prayers of the soldiers and sailors of the Catholic Rites) in the 1716 battles with the invading Ottoman Turks on the Greek island of Corfu. John, thanks again; this was a fun interaction. A contemporary Sacred Icon of St. Spyridon showing his beehive woven straw hat, his bishops stole, the blazing potsherd or brick with water dripping from it, and his holding the book of the Gospels (dogmatic truth based on the Holy Scriptures and the Sacred Apostolic Traditions of the Western and Eastern Rites of the Catholic Church. If anyone knows that artist that is responsible for this beautiful icon please tell me and I will credit him/her in this post. Icon found on Wikipedia and originates at St. Spyridon Orthodox Church in Loveland, Colorado (thanks to them for posting the image of this magnificent icon). A medieval icon of St. Spyridon, wall fresco, Bulgarian Orthodox, found in the Zemen Monastery, Bulgaria. Photograph may have been taken by I.E. Stankov in 2012 using a Canon EOS 600D camera. In the Roman Catholic Church, St. Spyridon is venerated on his feast day, December 14th; and on December 12th in the Eastern Rites and the Orthodox Church. Thanks for stopping by and reading this post. St. Athanasius of Alexandria was “the Lion” of the Council of Nicaea. He was instrumental in providing well argued testimony rebuking the heretic Arius during the Council’s debates. His verbal skills, as powerful and commanding as a lion, shredded Arius’ arguments. His eloquence convinced the assembled bishops of the correct dogma that Jesus Christ has two, separate and distinct, natures (divine and human), and that Jesus Christ is fully human and fully divine. The heretic Arius insisted that Jesus was “just a creature” of God. A contemporary icon, completed in The Egyptian Christian Coptic style, of St. Athanasius of Alexandria standing on the back of the heretic Arius (seen in very dark colored clothing) at the Council of Nicaea (AD 325). Athanasius is seen in front of the assembled bishops from the Eastern and Western Rites of the Catholic Church. He is holding the Council’s accepted conclusions in the document known as the Nicene Creed. Notice that he does not have a bishop’s mitre on his head similar to the bishops sitting in attendance behind him, and is dressed in what appears to be a deacon’s dalmatic with cape. The style of this sacred icon is very similar to the style of the Coptic (Egyptian) Orthodox Church’s sacred art; yet, the inscription above his head is in Greek rather than Coptic. Image found at churchofourladyofkazan.org; (thanks to them) throughWikipedia images. The Council’s main purpose was to address the divine nature of Jesus Christ and the concept of HIs being the Son of God the Father. This had to be done in order to squash the Arian heresy once and for all. It was also to establish a date for the celebration of Easter, resolve organizational and clerical issues, and the development of Church law (what today is called Canon Law). They were also attempting to settle a schism that had occurred in Egypt. That schism was being fomented by another bishop who had enlisted with the heretic Arius. The Council was also tasked with development of a Christian Creed that would provide unity of belief for both the Eastern and Western Rites of the Church. This unity of belief was critical since the Church needed a formal set of beliefs that could be used as a catechetical tool and a binder that kept all the cultural and geographical “Catholic” churches together. The Council of Nicaea basically resolved all the main issues of its agenda. It was a stunning achievement. The priest Arius was banished for promoting heresy and his ideas declared anathema. Yet, the problem the Council still faced was convincing Arius’ followers of their heretical errors. Banishment or not, an unrepentant Arius continued to spread his opinions fomenting confusion throughout the Empire. The above image is another example of a sacred icon, however, it is not completed in the Coptic style which originated in Egypt. It is an Eastern Orthodox icon (Greek, Russian, or one of the many other Eastern Rites of the Church), completed centuries after the Council ended in the summer of the year 325. It shows a non-heretical bishop castigating the heretic priest Arius (who is raising his hand in an attempt to stop the speaker). The bishop, because of his hat (mitre), appears to be labeled with Athanasius’ name found at the bottom); however, he is not clothed in a deacon’s dalmatic, nor did deacon’s wear that style of hat. It is believed that Athanasius was not ordained a priest and bishop until after the Council ended. The Emperor Constantine sits on the right dressed in imperial clothes and it may be surmised that it is Bishop Alexander of Alexandria (the bishop of Arius’ and Athanasius’ diocese) who sits to the immediate right of the Emperor. The Eastern and Western Rites of the Catholic and Orthodox Church have always believed that sacred icons and sacred images are always venerated by the faithful; they have never and are never worshipped.To worship sacred icons, sacred images, statues, and other visual reminders of the glory of God and His saints is against the 1st Commandment (confer Exodus 20: 2-17, and Deuteronomy 5: 6 – 21). If anyone worshipped those visual images they would correctly be called idolaters. Worship is for God alone, that is, the Holy Trinity – the Father, the Son, and the Holy Spirit; Three Divine Persons in One God. Our Savior Jesus Christ is One Person with two natures: human and divine; that is a state of being which is part of the great Mystery of the Incarnation of God into human existence. Jesus Christ is the Lamb of God, sacrificed in Jerusalem through His Passion, Crucifixion, and death. Jesus, following His Father’s will, suffered and died for us in order to atone for all of humanity’s sins (past, present, future). God the Father and God the Holy Spirit responded by raising Jesus from the dead on the third day, ultimately enabling Jesus to interact and be seen by His Apostles and hundreds of disciples. Truth, Goodness, Beauty, and Love, incarnate in our Savior. May you continue to have a prayerful Holy Week and a joyous Easter Season. The extensive Gospel reading for Palm Sunday relates the Scriptural and historical truth that Jesus triumphantly entered Jerusalem, yet, five days later He was arrested, put on trial, tortured, and executed. As you know, the religious and secular leaders of Israel did not accept Jesus as the Messiah and Son of God. They were adamant about the fact that Jesus was just a man and that His claims, teachings, and healings were all fraudulent. Their disbelief took place during the first century, yet, two hundred years later there were Christians saying the same thing. These were the same questions that the people of Jerusalem, some of them waving palm branches, and their leaders were asking each other. In the year 325 scholars and clerics were still grappling with those questions, too. Many deacons, priests, and bishops of the Church had settled the question in their own mind, yet, all of Christendom was not in agreement. Emperor Constantine was worried; as a military man he knew trouble when he saw it. Religious disagreements could easily spread into civil war. Something had to be done. Stories have come down to us through the centuries that St. Nicholas of Myra, a faith-filled bishop, decided to defend Sacred Tradition and the Scriptural interpretation of the reality of Jesus as the Son of God the Father. The story relates that he not only vigorously defended Sacred Tradition but became so worked up that during one of the debates he slapped the author of this heresy which was called Arianism. But, was it a verbal or physical slap? Partial icon of the “incident” at the 1st Council of Nicaea. Immortalized in an early icon. The Early Church was well aware of the importance of this Council in debating and agreeing to the specific dogmas of the Church that would be ultimately proclaimed in the Nicene Creed. All catechumens that enter the Church at the Easter Vigil Mass proclaim their belief in the great Sacred Mysteries and historical truths of the Nicene Creed. Who: Saint Nicholas of Myra, Bishop, (Myra, an Ancient Greek city on the coast of present day Turkey), vs. Arius, priest from the diocese of Alexandria, (Alexandria, a city on Egypt’s Mediterranean coastline). Emperor Constantine, Roman Empire, centered in the new city named in his honor: Constantinople (present day Istanbul, Turkey). Constantine convenes an ecumenical council of bishops from the five major patriarchies of Christendom (Alexandria, Antioch, Constantinople, Jerusalem, and Rome). What: Supposed incident of Bishop Nicholas “slapping” the priest Arius, at the first ecumenical Council of Bishops: the Council of Nicaea. This was the first Council since the Council of Jerusalem (held in the first century and was attended by luminaries such as St. Peter and St. James). When: Late Spring and early Summer of the year 325. Why: The incident concerned the critical issue of who is Jesus Christ, and whether Jesus Christ is “the same in being and the same in essence” as God the Father. Arius was promoting the heresy that Jesus Christ was “just a creature” of God and not a divine Person of the Holy Trinity. Where: Nicaea, an ancient city in Asia Minor; it is the present day city of Iznik, Turkey. As it applies to sacred art, the Council of Nicaea provided a specific creed: a set of theological proclamations that impacted sacred artists from the 4th century to the present day. It is stated clearly in this Creed that God the Father has communicated His love, mercy, and laws to humanity through His revealed word in the Hebrew and Christian Scriptures. This action culminated in the ministry, passion, death, and resurrection of His incarnated Word, His Son Jesus Christ. The Nicene Creed definitively proclaimed that Jesus Christ is the same in essence, and the same in being, as God the Father and God the Holy Spirit. So we have the great Mystery of the Incarnation, the nature of Jesus Christ: He is both human and divine – the Son of God – One Person with two natures – human and divine. The above is a 6th century sacred icon of Jesus as Pantocrator. Pantocrator is a Greek word describing the all knowing, all powerful Son of God: Jesus Christ. The Council of Nicaea declared that Christ, as God, is consubstantial: Jesus is the same in essence (substance) and in being as the Father and the Holy Spirit. Also, Jesus possesses two natures: human and divine. This is truly a great Mystery of the Church. The sacred artist of the above icon, probably a monk, used hot pigmented wax (the encaustic method) to render this likeness. This sacred icon is currently located in St. Catherine’s Monastery, Sinai Peninsula, Egypt. The face has a striking resemblance to the face on the Holy Shroud of Turin. The day-to-day proceedings and debate notes of the Council have been lost to history, so we will never know if St. Nicholas gave Arius a physical or just a verbal “slap.” Regardless, St. Nicholas made his point and contributed to giving us the gift of the Nicene Creed. In AD 381, the Nicene Creed was edited and amended at the First Council of Constantinople (thus, the Creed is called the Niceno-Constantinopolitan Creed. Try to say that phrase fast, three times!😃). Thanks for visiting with me. May you have a prayer-filled Holy Week. Sources for the above post are found in my bibliography post, entitled Early Church Fathers – A Short bibliography of February 8, 2019. I relied primarily on Pope Emeritus Benedict XVI’s works, also Aquilina and D’Ambrosio’s volumes. Copyright © 2011- 2019, Deacon Paul O. Iacono – All Rights Reserved. Permission to reprint must be obtained from the author in writing. Students may quote small sections of the article as long as the proper credit and notation is given. Thank you. Is communication just a trait of human beings? Is it a trait of God? The Dogma of the Holy Trinity is one of the great Mysteries of the Christian Faith. All Christians acknowledge and accept that The One True God, the divine Holy Trinity, are three separate and distinct Persons of the Father, Son, and Holy Spirit. The Holy Trinity is not three separate Gods. They are one God in three Divine Persons. This is known as the dogma of the “consubstantial” Trinity: each of the three Persons is God – completely and entirely. These ideas were debated and verified by the assembled bishops at the First Council of Nicaea in AD 325 and subsequent Councils (specifically the ecumenical Council of Nicaea/Constantinople in AD 381). In the 13th century the Fourth Lateran Council stated: “Each of the Persons is that supreme reality (nature, essence, and substance) of God” (confer Catechism of the Catholic Church, 2nd edition, paragraphs 198 through 315, pp. 54-84). These three Divine Persons relate and communicate among themselves and desire to communicate and relate with Their creation. This is verified through Holy Scripture, Sacred Tradition, and the historic teachings of the Apostles, the Ecumenical Councils, and the saints of the Church. 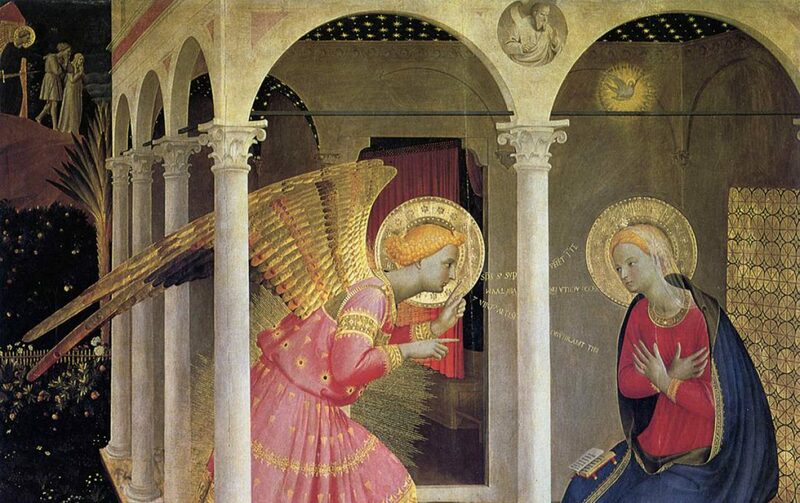 The first of Their creation, the nine choirs of angels, communicate with God and each other, too. Obviously, human beings communicate and relate through speech, behavior, and the written word, though at times, not very well. To a much lesser extent, there is “communication” in the other members of the animal kingdom (by instinct, chemical, and behavioral signals) and in the plant kingdom (through chemical signals). God the Father has communicated specifically through His Word, the incarnated Son, Jesus Christ. In accordance with the Father’s will the human Jesus is “born of a woman” into space and time through the great Mystery of the Incarnation of Christ. Jesus agreed to humbly obey His Father’s will. Through His Incarnation the Divine Son Jesus expresses His two natures: human and divine. He does this while “hiding” the full majesty of His divinity (except for the moments of His Transfiguration, Resurrection, and subsequent appearances to His Apostles). “When the Father sends His Word to His Creation He also sends His Breath. “Jesus and the Holy Spirit are on a joint mission, while at the same time being distinct but inseparable. It is the Son who is seen, the visible image of the invisible God, while it is the Holy Spirit that reveals Him.” (please refer to page 181 of the Catechism of the Catholic Church, 2nd edition, also pages 54 through 90). The Holy Spirit communicates and spiritually shapes us through the Holy Scriptures, liturgical and private prayer, the teachings of the Western and Eastern Rites of the Church, and with the Father and Son in the seven Holy Sacraments (in the Eastern Rites – the Holy Mysteries). The solemnity of Pentecost recalls the full expression of the Holy Spirit’s “Fruits and Gifts” to the Apostles, and through the Holy Sacraments to us, too (refer in the Christian Scriptures to the Acts of the Apostles chapter 2, verses 1 – 42; and in St. Paul’s letters to the Galatians chapter 5: verses 22 ff; and 1st Corinthians chapter 12, verses 4 ff; also refer in the Hebrew Scriptures to the book of the prophet Isaiah chapter 11, versus 2 – 3). “The Trinity”: early 15th century; egg tempera and gold on wood panel by St. Andrei Rublev (1370 – 1430). St. Rublev was a Russian Orthodox monk. He resided and “wrote” with egg tempera paint to produce images of God, the angels, and the saints in sacred icons. He lived at St. Sergius Monastery in Moscow, Russia. His sacred icon above captures some of the truth of the Three Persons of the Holy Trinity communicating with each other. God the Son, Jesus Christ, is the figure in the center of this painting. You see two of His fingers extended to express His human and divine nature, and in a pointing gesture, to the “Cup of His Blood” made manifest through His Redemptive sacrifice. In this masterpiece you observe the colors blue representing divine life and purple madder/burgundy signifying Christ’s humanity. God the Father is on your left and God the Holy Spirit is on your right. The Holy Spirit is garbed in blue and in green as a symbol of new life and spiritual growth through prayer and the Holy Sacraments (Holy Mysteries). God the Father is painted in both blue, green, and a very light, transparent gold ochre. The First Council of Nicaea (AD 325) verified and promoted the Dogma of the Holy Trinity. This Dogma was reaffirmed, and further explained by the Council of Nicaea/Constantinople in AD 381. A contemporary copy of the original Trinity by Rublev. God the Father sent His Son to be born of a woman through the fecundity of the Holy Spirit. The Incarnation of Jesus Christ changed the Universe. God became flesh and walked among us. Why? In order to teach, heal, and redeem us from our sins. The New Covenant with His creation is written in His Blood. There is, if you have the gift of faith, ample proof that God wants to communicate with you. It is up to each man and woman to honestly determine whether or not they are ignoring Him, and if so, to decide what to do about it. Time is short. Copyright © 2011- 2019 Deacon Paul O. Iacono All Rights Reserved. Categories: Jesus Christ, Our Blessed Mother, Beato Fra Angelico, St. Francis of Assisi, Gospel Reflections, Art, Sacred Art, Sacred Images, Sacred Artists, Icons and Iconography, Orthodox Art, Catholicism, Christian Spirituality Christianity, Roman Catholic, New Evangelization of the Catholic Church, Saints, etc.